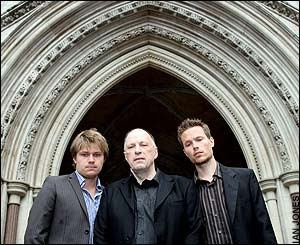 Joss Garman, John Stewart and Leo Murray outside the RCJ yesterday. As a member of the Woodland Trust who supports the campaign for aviation to pay for the environmental damage it causes, I have kept an eye to see whether I would, along with 5 million others, turn up on BAA's environmentalist blacklist. BAA, owned by Spanish construction and services group Ferrovial, went to the High Court in London to restrict the actions of campaigners, various environmental organisations and those due to attend the annual The Camp for Climate Action located near the airport between August the 14th and 21st. Coming more from the stable of discourse rather than direct action, I nevertheless have a strongly held admiration for those who take to the runways to make their voice heard. They are the frontliners, the ones who make others - and clearly BAA - sit up and listen, even when they do not want to. And it has to be said that Joss Garman and Leo Murray of the anti-avaition group Plane Stupid, more than any other environmental organisation, have firmly placed the issue of flight CO2 emmissions on the radar. They have proven to be a great stumbling block in BAA's smooth flightpath of profit at the expense of the planet. So much so that BAA felt compelled to take their own radical action, seeking an injunction to curtail protestors from disrupting Heathrow during the week-long climate change camp which is due to commence next tuesday. Their hit-list of objectional protestors included, against others, Airport Watch which is an an umbrella group of various organisations including the Royal Society for the Protection of Birds, the Woodland Trust and the Campaign to Protect Rural England. But it didn't wash. 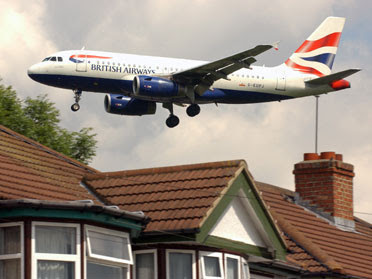 Yesterday the proposed injunction against Heathrow Campaign Against Aircraft Noise(HACAN), No Third Runway Action Group(NoTRAG), AirportWatch and Geraldine Nicholson (Chiar, NoTRAG) was dismissed. Instead Mrs Justice Smith at the High Court imposed a vastly limited injunction covering trespass and nuisance upon just three named organisers - John Stewart (HACAN), Josh Garman and Leo Murray. All three had previously offered undertakings to the court that they would not engage in disruptive direct action. The The Camp for Climate Action planned for the 14th to 21st August is allowed to continue and remains injunction free. This was an ambitious pitch and corporate flexing of muscle by BAA. It was in essence a challenge against some of our basic human rights: freedom of thought, conscience, expression, assembly, peaceful protest and freedom of association. However, despite demanding the whole cake they ended up with only the crumbs. Mrs Justice Swift in her decision ensured this was a victory not only for human rights but also for common sense. "By joining the climate camp at Heathrow next week, you will be making a stand not only against climate change, but also against the attempt by BAA to stop people from agitating for a better world. What began as an environmental demonstration has now also become a protest for democracy. I will be there. What about you?" I`ll be there, how about you?